Energetic, enthusiastic performance to match any setting. LED and fire performance both available. I have been hooping since 2011, and performing since 2013. Available for roving entertainment, choreographed dance, or even just a flashy act to add to your event. I am a very friendly, professional performer. Depending on your event, I am more than happy to interact with your guests between sets. Choreographed performances (including fire) are about 3-5 minutes in length each. I am an advanced-level hoop performer, with dozens of tricks in my repertoire. I can make full use of any space allotted, and many of my larger tricks have left the audience awed and excited for more. I am able to perform to live or recorded music of any genre. musically trained myself, I can follow any tempo or mood. Appropriate costuming to be arranged on an event-to-event basis. I have been involved in various genres of dance since my teens. 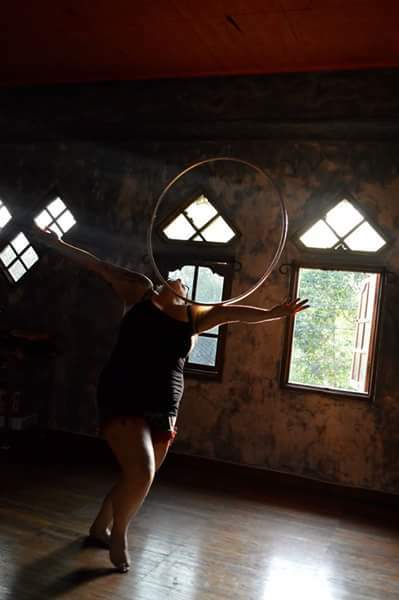 I found my love for hooping in 2011, and have been performing since 2013. I have trained under several of the world's most popular and viral hoopers, and continue to train to ensure my performances are always new and fresh. I love having the chance to hoop to live music and DJs, and have done so through many genres: electronic, folk, metal, punk, rock, cabaret, and more. I am seen around town enough with my hoops that I am often recognized as "the hula hoop girl". I have also recently begun teaching classes, parties, and workshops.